The other night I stepped on Ralph, despite all the night lights. He was sleeping just on the other side of the air conditioning curtain and by the time I saw him it was too late. Have I posted about the air conditioning curtain? It works on the heat curtain principle, but in reverse. It is the only thing that makes sleeping upstairs in the summer bearable. 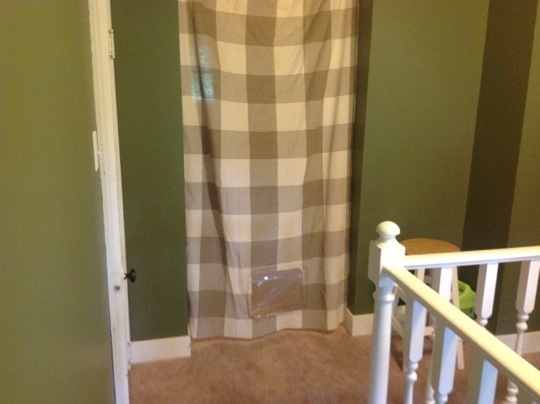 It was Lloyd’s genius idea – hang a curtain over the upstairs hallway, open the vents upstairs and close the ones in the rest of the house. The cool air is pumped to the second story, cools it down and then trickles down to the first floor. The problem is the lazy cats that lie in wait. I put a window at the bottom of the original curtain, but the cats hang out on the sides. Idiots. UPDATE: After one night with this thing, I regret spending the extra couple of bucks for the heavy-duty plastic. Sure, it will last longer, but it is noisy when moved, and at midnight there was an Epic Battle between the House of Wally and the House of Ralph and both sides were using it as a shield. Grrrrrrrr…. My folks did this on the first floor of the old parsonage. However, they took a heavy bedspread and nearly nailed it to the wall. Haha….next time you’ll have to film the epic battle! So is Ralph a cool cat & Wally more of a tropical kind of guy….based on which side of the curtain they seem to prefer. There still is the option of putting lights on the cats. Or maybe you could put lasers on them. Then the battle of the Houses would be even more epic. pew! pew! pew! Ha! That is awesome! I love watching cats fight. Of course as long as they aren’t killing each other. 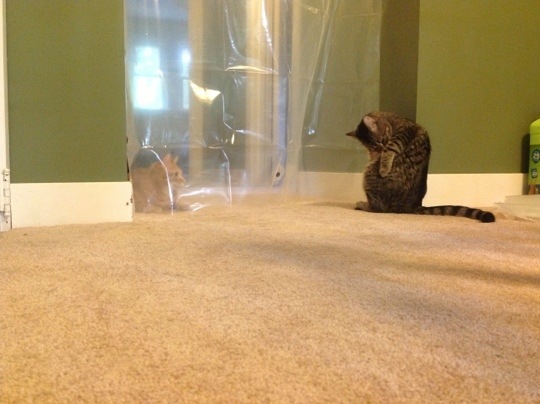 If you like the curtain better, try adding a foot of the plastic to the curtain. It shouldn’t make so much noise.